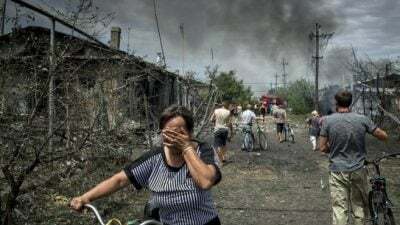 Breaking: Donbass Shelled Under NATO Command. New Offensive to Begin in Early May? Earlier today, Fort Russ published an op-ed by Russell Bentley, who revealed that a new offensive is about to begin on the Donbass in early May. Today, mortar shelling has been carried out on the Yasinovaya town by the Ukrainian army, under the command of NATO. Such a statement was made by the deputy head of the operational headquarters of the self-proclaimed Democratic People’s Republic of Donetsk, Eduard Bazurin. “According to our information, the operation was conducted by NATO artillery advisers, who arrived the day before to conduct field tests and training of Ukrainian security forces” said Basurin. He added that American radar systems are deployed on the roofs of several multi-storey houses in Avdeevka, a few kilometers north of Donetsk.